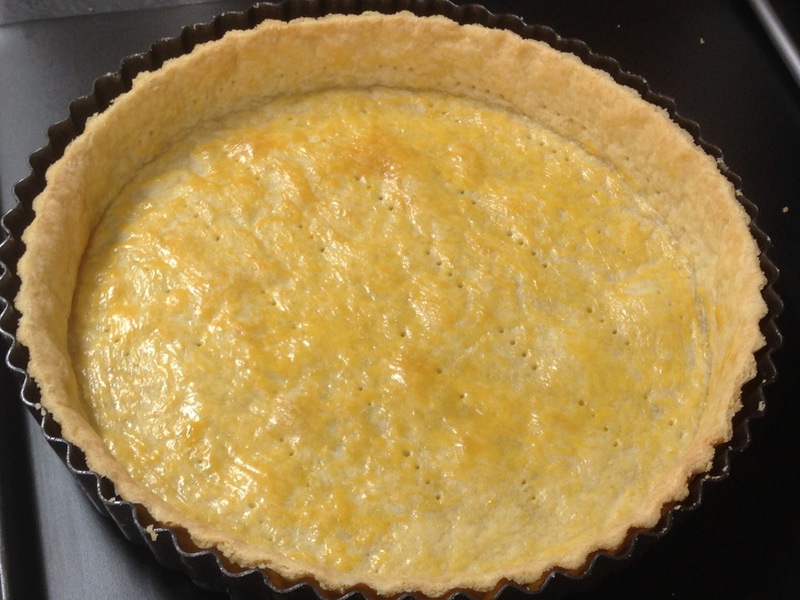 Sweet Shortcrust Pastry or Pate Sucree is an enriched dough and the pasty of choice for sweet flans and tarts. How enriched, how sweet and how short all seem to be a matter for debate. At the end of the day, much of this is down to personal choice. I’ve stuck to some basic principles here, starting with a 2:1 ratio of flour to fat. I want this pastry to be suitably different from ‘normal’ shortcrust, but it still needs to be workable. All butter and one egg yolk does the trick for me, making a rich pastry which is nice and short. I’ve used a whole egg in the past (reducing the amount of cold water needed), and this is fine but adding extra yolks is a bit over the top and tends to lead to a dough which is just too sticky. Another variable is the amount of sugar. I’m using 25g, about 2 level tablespoons, and I’m using castor sugar which helps the texture, rather than using icing sugar. This is sweet enough for me and good for most recipes. That said, I’ve see equivalent recipes with 4-5 times as much sugar in. Extra sugar will impact the ability of the pastry to hold together once cooked and will have a greater tendency to burn. In the current climate with threats of sugar taxes, I think this amount is just right. Optionally you can add flavourings to the mix such as a little vanilla extract or the grated zest of an orange if that is going to work with your filling.